The brain is the processing center of a human body. It is protected inside cranium (also called brain box) in the skull. There are three layers of membranes (connective tissue) that cover the brain called meninges. The three meninges are dura mater (touches brain), arachnoid mater and pia mater (touches skull) from outside to inside. There is a space between pia mater and arachnoid mater is called subarachnoid space which is filled with Cerebrospinal fluid (CSF). Every part of the brain is covered by these meninges. The function of these meninges is to reduce friction with the brain and keep brain moist. It can also act as shock absorber, so can help to protect brain. The inflammation of meninges is called meningitis. Brain has many smaller furrows (convolutions) associated with it because it helps to increase the surface area. Grey matter, which has a pinkish-grey color in the living brain, contains the cell bodies, dendrites and axon terminals of neurons, so it is where all synapses are. White matter is made of axons connecting different parts of grey matter to each other. Brain has grey matter outside and grey matter inside. Average surface area of the human brain is 2500 cm square. TheBrain is divided into three parts. It is the longest part of the brain which lies anterior in the brain box. It is the 2/3 of the whole brain and divided into left and right hemispheres. The demarcation of hemispheres is done by a deep cleavage called fissure. Major function of cerebrum are as follows. It is the center of intelligence, memory and imagination and emotions. It is responsible for ordinary sensation like touch, pain, heat and cold. It also controls special senses like sight hearing smell etc. It controls the other parts of the brain. It also helps to conduct different types of motor actions of muscles. It is the middle part of the brain which is responsible for maintaining body posture. Its major functions are as follows. It maintains equilibrium and controls the posture of a body. It makes the body movement smooth, steady and coordinated. It also regulates and coordinates contraction of skeletal muscles. It is the posterior part of the brain which controls overall activities of the body. 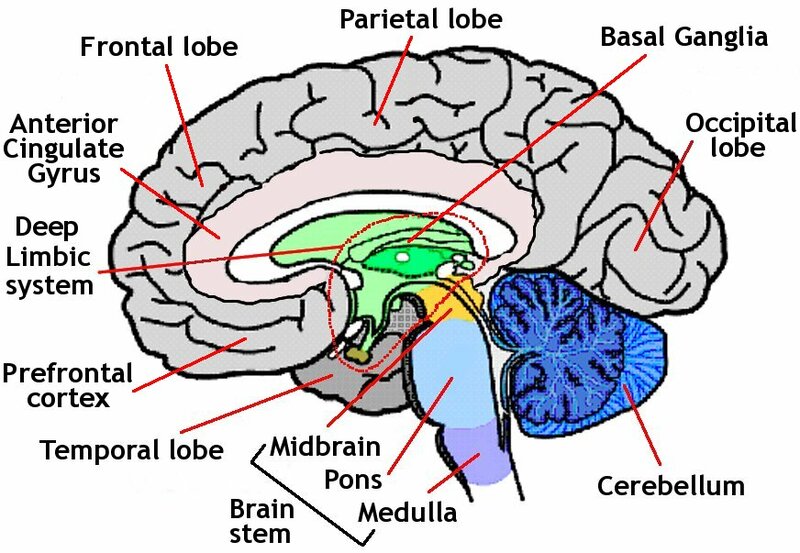 It is also a part of the brain called brain stem (includes Pons and Mid brain). The main functions of medulla oblongata are as follows. It receives an integrate signals from the spinal cord and sends resulting impulses to cerebrum and cerebellum. It contains different centers that regulate heart rate blood pressure breathing, swallowing, salivation, sneezing, vomiting, coughing and some other involuntary activities. Brain is the processing center of a human body. It is protected inside cranium (also called brain box) in the skull. There are three layers of membranes (connective tissue) that covers the brain called meninges. Brain has grey matter outside and grey matter inside. Average surface area for the human brain is 2500 cm square. Brain is divided into three parts: cerebrum, cerebellum and medulla oblongata. Name the parts of brain and give functions of each part. 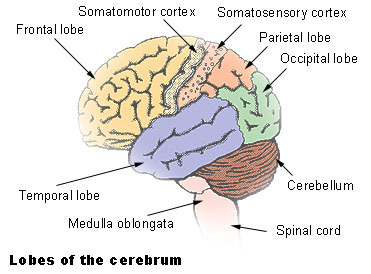 Parts of brain and their functions are: a. Cerebrum: i. It is involved in thinking. ii. It is involved in memory. b. Cerebellum: It maintains the balance of the body. c. Medulla Oblongata: i. It controls her heart beat. ii. It contracts and relaxes the blood vessels. After long time a person started to write a letter to his friend. During this cerebrum of that person helps to fix the things to write and what may be the work of cerebellum in the work? Cerebellum maintains equilibrium of the muscular movement of his fingers which makes movement smooth, steady and co-ordinated. Define the cerebrospinal fluid with its function. The space between the arachnoid mater and piameter is filled with a fluid which is called cerebrospinal fluid. - Cerebrospinal fluid protects the brain from mechanical shocks and injury. Brain is the highest co-ordinating center of the body. The brain is enclosed in a bony case, the cranium or brain box. Three protective layers covering called meninges filled with extra cellular fluid act against shock and mechanical injury. Write the name of three layers of meninges. Which of the following is not the part of the brain? Which of the following is known as the longest part of the brain? Which statement is true for cerebellum? It helps to conduct different types of motor actions of muscles. It maintains equlibrium and controls the posture of the body. It controls the functions of other parts of the brain. It is responsible for ordinary sensations. Which stament is false for cerebrum? It is the center of intelligence, memoey, imagination and emotions. It makes body movement smooth, steady and co-ordinated. _______ receives an integrate signals from spinal cord and sends resulting impulses to cerebrum and cerebellum. what happens when spinal cord is injured? Any Questions on 'Human Brain '?